This is not a weight-loss blog, but it is a healthy eating blog, so of course I mean eat more fruits and vegetables. Empty calories are NEVER going to fill those kids up. Empty calories WILL make them fat. I don’t want that to happen to my family. Obesity is a problem in this country and it’s time we open our eyes and quit making excuses for our family. So much of the food I used to feed my kids was empty calories when what they really needed was nutrition to fill them up. I had no idea that most of the food in the center of my grocery store was not really food, but food-like substances. I am definitely guilty of feeding my kids fruit gummies and thinking they were OK because they were fruit. Ummmm………..not even close to fruit, I know now. I heard a guest on one of the afternoon talk shows say eat big salads. Really big. Think about cooking down that lettuce and how it would be just a little bit of food. Now, that doesn’t mean load a salad with fried chicken fingers, cheese, bacon and dressing and think you are eating a healthy salad. 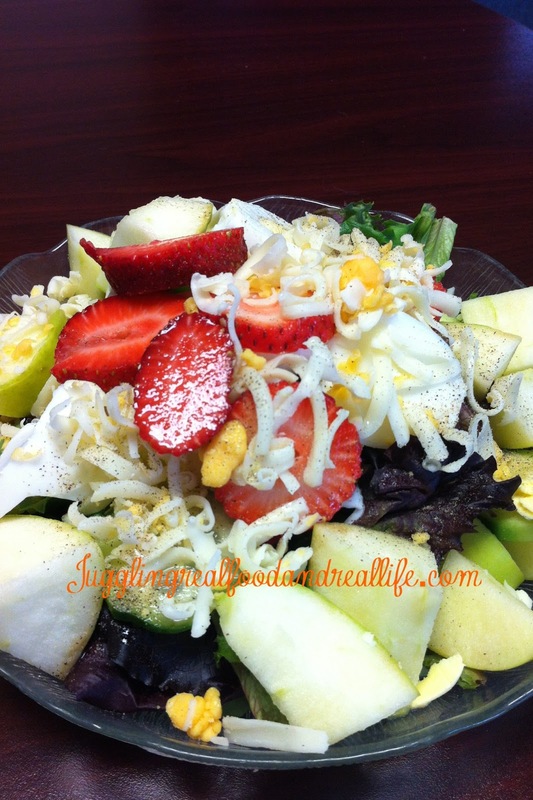 The salads that I’m speaking of are a mix of greens, vegetables, fruit and little bit of dressing. Eat as much of that as you want and I promise you won’t put on weight and you will feel like you’ve had plenty to eat. So, my first strategy to fill my family up is to make sure there are lots of salad fixings ready to go so they can just make up a quick salad. I also plan to have the salad greens washed and vegetables chopped so they are ready for me to put a salad on the table with each dinner. 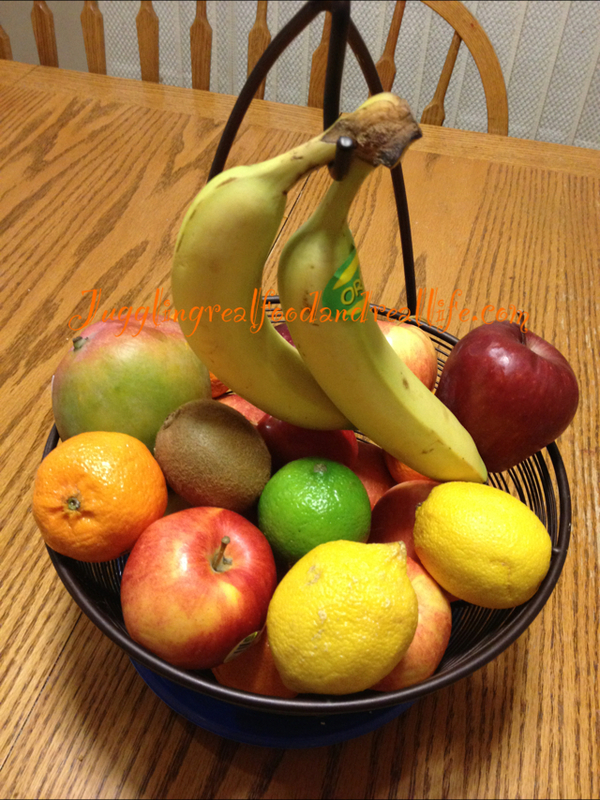 a fruit bowl full of apples and bananas. These are two favorites in our house. There are no rules with my fruit bowl. Anyone can grab whatever they want, whenever they want. I don’t need them for other recipes ( I would put them elsewhere if I did) so nobody is going to get in trouble for eating anything. This is the replacement for the snack cupboard which used to be filled with gummie snacks and processed white flower and sugar 100 calorie packs. Strategy three is cucumbers. Three of the kids love cucumbers. I gladly buy and chop cucumbers so they are ready in the fridge to grab. I keep them right up front so when they stare into the fridge for something to eat………..cucumbers are what they see. I also buy bags and bags of baby carrots and oranges. I don’t hide them in the vegetable drawer, I keep them right at eye level. Again, I don’t complain that they have eaten them all. I don’t want to send the wrong message. I don’t want them thinking that eating healthy snacks is a bad thing. Now it’s your turn………..what strategies do you use to keep your family feeling full and satisfied? We are a family who likes to eat real, not a family who likes to be hungry. I would love to hear from you. Thank you for all of the love and support. Don’t forget you can join us on Facebook for more fun and support along the way. You can also follow us on Twitter @Jugglngrealfood if you are interested in learning more about the Real Food Movement. You can also follow our boards on Pinterest. If at any time, you want to join the Juggling Weekly Challenges, you can do so by leaving me a comment below indicating your interest. I would love to know how many adults and how many kids are participating. Great tips for eating more, but healthy! I have a hard time getting extra fruits into my kids. We go through spurts with eating them. I like to do apples and bananas too, those are their favorites, but sometimes I'll buy them and it just sits. I think the biggest thing that I will give as advice is just to have it handy and readily available to eat. I like the tip on having the cucumbers chopped up ready to eat. If I have things ready for them, they're more likely to eat that instead of something not healthy. Thanks for stopping by Mary. My kids eat lots of fruit, but I do see times where they give up on it. At those times, I usually turn the fruit bowl into a smoothie or make baked goods with it. That usually gets them eating. I better get back to chopping……..I hope you come back to visit often. Often you hear me say, "you are hungry, what fruit or veg would you like?" If there is only one lousy looking banana and the only veg in the fridge is an onion. The results are bad, and kids are not going for it. But if there are apples, pears, bananas, oranges, kiwis, grapes, cucumbers, carrots, celery, and jicama. Then the kids are excited about finding a fruit or veg to eat. I try to keep at least 3 fruits in the bowl at all times. It is a challenge with three hungy kids and they aren't even teenagers yet. But it is a habit that I am building for life. I am grateful for the local grocery store who started a fill the bag of produce for $10. They pick out about 10-12 items that you can fill the bag with (mix and match). It makes for great produce prices. They have started a trend that other stores in the area are following and it makes me super happy. Every couple of weeks one of the stores around will have a $10 produce bag on sale. I love how you frame your question. I never thought about it, but "What do you want to eat?" is way to open-ended and broad. I'm going to give that a try. I am so jealous of your $10 bag of produce. We don't have that around here. Hopefully, it is on its way. I think a lot of it has to do with what the kids see too, if they see me constantly getting into the chocolate chips, that is what they want. If they see me eating a salad at lunch every day, that is what they want. I think that having kids help in the kitchen is great as well as growing vegetables, even if it is only herbs in a windowsill. Great job turning away from the junk! Thanks for stopping by Heather. You are so right. Kids will follow what they see. It is so important for us parents to be a healthy example. I have noticed that my kids are more likely to try something if they have helped to cook or grow it. I need to do more of that. Great advice! I hope you come back to visit often. It's a great idea to have the healthy items they love sliced and ready to go in the 'fridge! Thanks for stopping by Rosey. I agree! So so true! Keeping things visual is definitely key…yay for healthy eating! Thanks for the twitter follow! Love your blog. I like to keep a bag of small healthy muffins in the refrigerator. I usually freeze half a batch of muffins so if they get tired of one kind of muffin, I can rotate to another kind. I totally do the having the fruit on accessible on the counter too! When I asked my little guy the other day what his favorite breakfast was he said APPLES! Something this momma LOVED hearing!